New Orleans can be highly addictive and no more so than with its distinctive cuisine. For someone who considers that all the major food groups are best encompassed on the dessert menu, it’s as close to heaven as it’s possible to get. Bread pudding is something I’ll always associate with New Orleans. It’s a staple on most Creole restaurant menus and variations abound. The traditional bread pudding is usually accompanied with a piquant bourbon sauce and is made from stale French bread although, in truth, any kind of bread will do, even common or garden variety sliced white. For something a little different, try croissants. The chefs of New Orleans are nothing if not adventurous. I first visited the wonderful Palace Café on Canal Street soon after it opened in 1991. It is co-owned by Dickie Brennan, whose family lives and breathes great restaurants. He trained in the kitchen of the family’s landmark Commander’s Palace in the Garden District under Chef Paul Prudhomme; Dickie’s other great restaurants are Dickie Brennan’s Steakhouse and the Bourbon House Seafood and Oyster Bar. 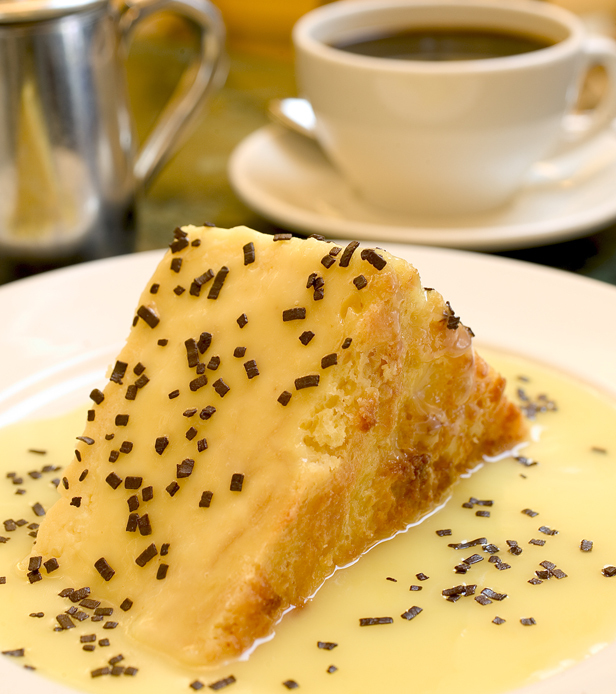 But whenever I’m in New Orleans, I always end up at the Palace Café, even just to pull up a stool at the bar late in the evening and pay my respects to a staggeringly luscious variation on the bread pudding – the White Chocolate Bread Pudding. Whisk the eggs and egg yolks in a large mixing bowl. Whisk in the warm chocolate mixture in a slow steady stream; scrape the saucepan with a rubber spatula to remove all the chocolate. Preheat the oven to 350 degrees Fahrenheit (180 degrees Celsius). Cut the French bread into thin slices and place in a 9 x 12-inch (23cm x 30cm) baking pan. Pour half the chocolate mixture over the bread and let stand for 5 minutes. Press the bread into the chocolate mixture with a rubber spatula or fingers to saturate well. Pour the remaining chocolate mixture over the bread and stir to mix well. Cover the pan with foil and bake for 1 hour. Remove the foil and bake for 30 minutes longer or until golden brown. Cool to room temperature and chill, covered, in the refrigerator for 6 to 8 hours or until set. For the GANACHE, bring the whipping cream to a boil in a small saucepan. Remove from the heat and add the white chocolate pieces. Let stand until the chocolate melts and stir until smooth. Loosen the pudding from the sides of the pan with a knife and invert onto a work surface. Cut into squares, then cut the squares diagonally into triangles. Place the triangles on a baking sheet and reheat at 275 degrees Fahrenheit (135 degrees Celsius) for 15 minutes or until warm. To serve, place the pudding triangles on serving plates and top with the ganache. Garnish with dark chocolate shavings. The Palace Café can be found at 605 Canal Street, on the edge of the French Quarter. For reservations, phone (504) 523 1661. Many thanks to the Palace Café for this recipe and photo.